Purines have been at the center of gout diet management for many years. But is the purine involvement overstated? Worse still, is it wrong? We all know that gout is caused by excess uric acid, but where does this uric acid come from? There are two sources – some from the food that we eat (external purines), and some from our own natural cell metabolism (internal purines). As this is the Gout Diet Section, I should focus on purines from food (and drink), but I believe it is important that you understand how our own purines affect gout before we consider the additional purines from meals and snacks. When cells die in our bodies, complex chemical reactions break down the cell contents, forming purines and other substances. Our kidneys extract uric acid from blood, then return most of it, excreting any surplus. Several factors will influence what our kidneys consider to be a surplus, and that process can be changed by genetics, the amount of protein in our diet, other substances such as alcohol and some medicines. Where uric acid becomes too concentrated in our blood, it will pass into joints and other tissues, where it may form the crystals that cause gout. It is important to realize from this that, irrespective of diet, our bodies produce their own uric acid supply. Complex processes work on the raw materials (purines) and may create the excess uric acid that can cause gout. External purines from our diet simply increase the raw materials available for uric acid production. If our bodies have problems in parts of the internal purine processing described above, then external purines might make the problem worse, but they do not cause gout directly. Think of traffic at a busy intersection. When all is OK, the traffic flows, but if there is an accident, extra traffic adds to delays – it does not (usually) cause more accidents. Traffic is internally generated as an essential part of city life, and it can be increased by external traffic from visitors. When traffic problems occur, we do not ban visitors, though we might advise alternate routes. When uric acid processing problems lead to gout, do not ban all your favorite foods. Life will become miserable, and you might achieve nothing. Yes, reducing external purines has a good chance of reducing uric acid. But it is a slight reduction, which is rarely sufficient to bring uric acid in the blood down to safe levels. If your uric acid levels are up to about 8 mg/dL ( 0.5 mmol/L), then you might consider purine control as a gout management option, though be sure to understand that all purines are not the same. For any levels above that, purine control is, at best, a component in a comprehensive gout management plan, or, at worst, a complete waste of time and effort. If you do decide to control purines to reduce your uric acid level, you must be very careful. As I explain in my other purine articles, there are many different types of purines, yet almost all published information quotes total purine content. The 4 main types of purine are Xanthine, Hypoxanthine, Guanine, and Adenine. Of the 4 main types of purine, only two have been shown to increase uric acid levels. Not all purines are equal, so be careful when you look for foods high in purines. The purine rich foods chart is a better resource for purines that are most likely to affect gout. Gout research tells us that we only need to consider purine food from animal sources. Vegetable purines do not increase uric acid. Vegetable purines mean food from plant sources. Therefore you can ignore the purine content of legumes, fruit, nuts, seeds, and all other food from plant sources. There is another group – mushrooms and other fungi, such as yeast. These are rarely consumed in high enough volumes to cause uric acid problems. However, you always need to take a personal view. Also get regular uric acid tests from your doctor. 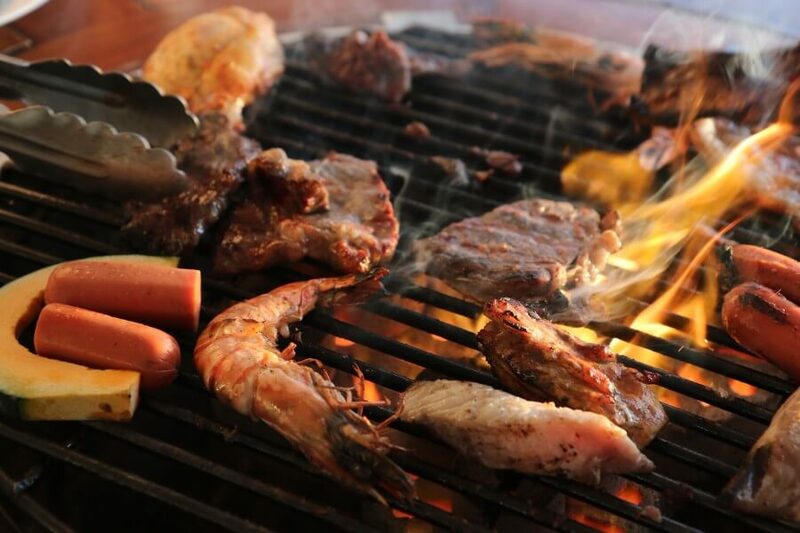 Purine foods on the barbecue? How do you plan purine foods for gout? You now know that purine foods, the source of uric acid, may come from gout diet. But mainly come from our own bodies as part of natural cell turnover. Of the purines in food, only two out of the main four purines are likely to affect gout. Read the purine rich foods chart for details of the individual purines in certain foods. That is the only way to see foods high in purines that affect gout. To be certain that your dietary changes are improving your uric acid level, you must carefully monitor uric acid in your blood. Leave this Purines page to browse the Gout Diet Section. Do you have suggestions for improving Purines? Then, please add your idea to GoutPal’s Purine foods discussion. Or, send the Feedback Form, below.